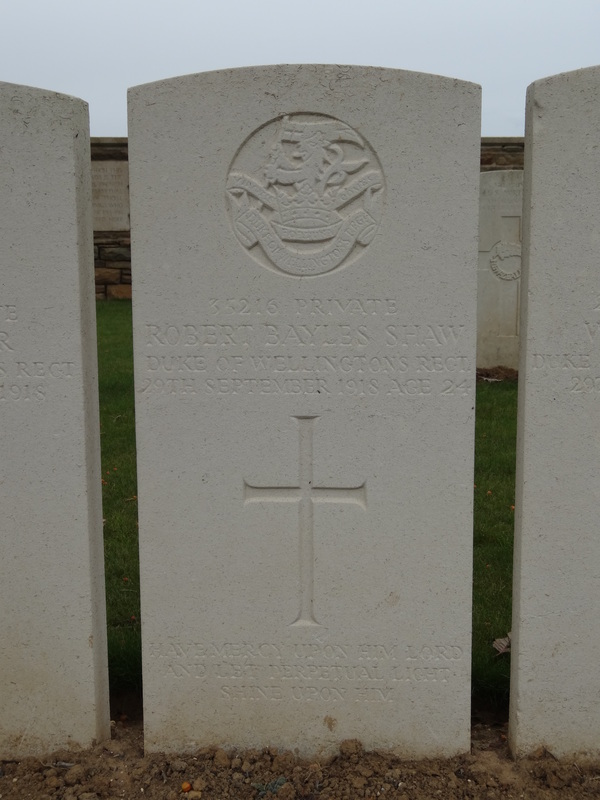 35216 Private Robert Bayles Shaw, 2/4th Battalion, the Duke of Wellington’s (West Riding Regiment) was killed in action 29 September 1918 and is buried at Masnieres British Cemetery, Marcoing, France. He was 24 years old and is commemorated on the West Auckland War Memorial and the Roll of Honour, West Auckland Memorial Hall. In 1901 the family lived at Diamond Terrace, West Auckland and 29 year old John worked as a coal miner (hewer). By 1911, the family lived at 7 Diamond Terrace and John still worked as a coal miner (hewer). 17 year old Robert worked as a coal miner (banks man). Robert married Beatrice Hannah Tweddle at St. Helen’s Auckland Parish church 17 April 1918. Robert lived at 11 Oakley Street, West Auckland and Beatrice in 1919 lived at 28 Chapel Street, West Auckland. Robert Bayles Shaw attested 8 December 1915 aged 21 years 3 months and joined the Training Reserve Battalion. He undertook a medical examination 3 April 1918 when aged 23 years 6 months. He was 5’5½” tall and found “fit for foreign service”. His religion was Church of England. 9 December 1915, Private R.B. Shaw was posted to the Army Reserve and was mobilized 20 April 1918 and 21 April 1918 joined the 85th T.R. Battalion. 6 May 1918 he was transferred to 3rd Battalion, the East Yorkshire Regiment (being given the regimental number 39178.) 29 August 1918 he embarked for France and 30 August 1918, Private R.B. Shaw was posted to 1st Battalion, East Yorkshire Regiment. 2 September 1918 he was transferred (compulsorily permanently) and posted to the 2/4th Battalion, the West Riding Regiment. Private R.B. Shaw was given the regimental number 35216. Private R.B. Shaw was reported killed in action or died of wounds on or shortly after 29 September 1918. Later research records that between 1 and 30 September 1918, 2/4th Bn., the West Riding Regiment (Duke of Wellington’s) lost 90 Other Ranks killed in action or died of wounds including 39 on 29 September 1918. The 2/4th Bn., War Diary has not been researched thus the circumstances of these deaths is, to date, unknown. 35216 Private R.B. Shaw was awarded the British War and Victory medals.